This spring, come discover the roots of Oregon Wine Country while exploring the wineries of Dundee Hills. Back in 1965, David Lett probably didn’t know he was pioneering the Willamette Valley wine industry, but when he chose the Dundee Hills to plant the first Pinot Noir, it turns out he launched what is now known worldwide as a vibrant winemaking community. The world really started to noticed when his Pinot Noir beat more established French labels in the Gault-Millau French Wine Olympiades. Other winemaking trailblazers in the Willamette Valley included the Sokol Blosser and Erath family. Eyrie Vineyard, Sokol Blosser, and Erath all have welcoming tasting rooms. 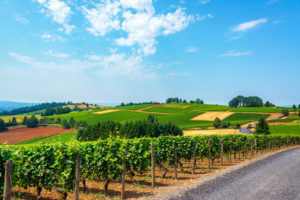 Visit all three wineries while touring the Dundee Hills, and taste the origins of Oregon wine this spring. You may come to the Dundee Hills to taste the world-class wines, but while you’re here you’ll enjoy the views of rolling vineyards and distant mountain peaks. This area also benefits from residing in a rain shadow, creating a dryer, sunnier climate; an enjoyable place to be in an otherwise rainy northwest spring. The Bed and Breakfasts of Yamhill County make an Oregon wine getaway easy to plan. With over 20 member bed and breakfasts, visitors will find the perfect fit for their ideal vacation. There are several beautiful Inns within the Dundee Hills area, each perfect for a wine tasting getaway. Find your favorite Inn, and book your getaway today!